Colonies on potato dextrose agar at 25°C are initially white, become gray to grayish-black at maturity, have a moderate growth rate, and are somewhat floccose. Hyphae are septate and hyaline. Conidiophores may occur singly or in penicillate groups. Annellides are approximately 5-10 x 2.5-3.5 µm, flash-shaped, and display cylindrical annellated zones varying from 0.8 — 1.5µm wide. 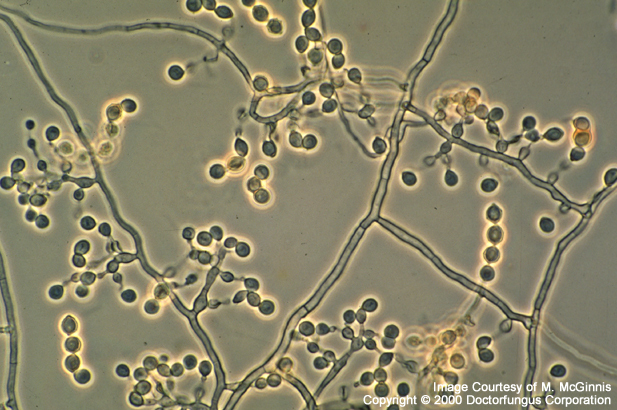 Conidia are brown, occur in chains, have a truncate base, measure 4.0-5.5 x 3.5-4.5 µm, are subglobose, and mostly rough-walled  , . Scopulariopsis brumptii has been reported as an agent of hypersensitivity pneumonitis in an addict .